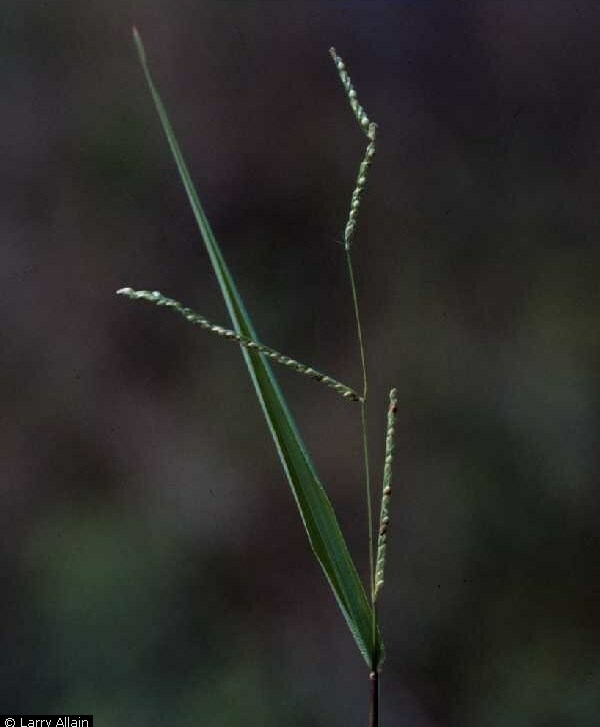 Paspalum setaceum.Larry Allain @ USDA-NRCS PLANTS Database (Accessed 5/2014). Paspalum setaceum is a perennial C4 grass (Waller and Lewis 1979) from a knotty rhizome, tufted, stems sometimes long hairy, 30 cm to 1 m tall, often prostrate; sheath keeled on back, loose, often separated from stem at top, ligule tan, membranous 0.1 cm. Leaves 5-30 cm long, 0.2-1.5 cm wide, margins hairy, sometimes hairy on both sides. Flower spikelets 1-flowered, green becoming tan, about 0.2 cm, rounded on one side, flat on the other, hairless or minutely hairy, single glume on flat, outer side, sterile lemma over inner curved side, 2-3-veined, crowded in 4 rows along one side of flat axis; inflorescence of 1-4 spikes; blooms and fruits June-Oct.
Habitat: Part shade or open areas, edges roadsides, fields, dry to moist soil.